Part of CAELESTIA's collection of photos, articles and eyewitness accounts deals with atmospheric reflection and refraction phenomena. In collecting these data we found evidence of a seemingly forgotten, yet most peculiar optical phenomenon: the appearance of luminous streaks or vertical cigar-shaped lights in the night sky that are not related to either the Sun or the Moon, and cannot be explained in terms of mirages, aircraft contrails, manifestations of the aurora, comets, meteor trails or chemical clouds released by rockets. A closer look at these sightings revealed that the reported phenomena were caused by extremely bright ground-based lights reflecting off high clouds of ice crystals. We identified six types of light sources that can produce this particular type of reflection (a survey is given in Chapter 5). On top of the list are the big flames that originate from wellheads and standpipes at oil refineries and petrochemical plants. A typical pillar-shaped reflection in cirriform clouds caused by the bright light of a gas flame at the Dow Chemical plant in Terneuzen, The Netherlands. The picture was taken on January 7, 2007, by amateur astronomer Klaas JOBSE who spotted this bright specimen from Oostkapelle, 32 km (19.9 miles) northwest of Terneuzen. 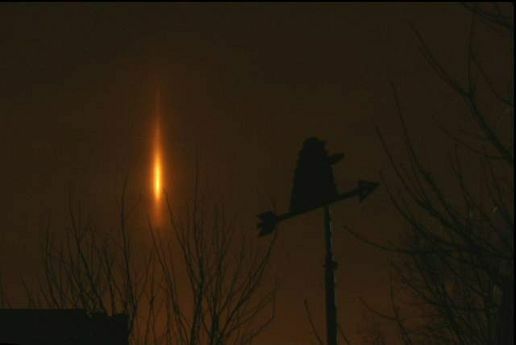 See our picture gallery for additional pictures of this and similar light pillars. Re-evaluation of thousands of reports of unidentified aerial phenomena, both from the scientific literature and from the UFO files, revealed that a small, but nonetheless substantial number of UFO/UAP reports can be explained by pillar-shaped reflections in high clouds. By July 2007, CAELESTIA had gathered information on more than one hundred reports of unusual sky phenomena that are suspected to have been caused by them. Written references on light pillars in high-altitude clouds are extremely rare. Most standard works and specialized websites on atmospheric optics pay little or no attention to the phenomenon . In the best of cases a photograph or sketch is presented accompanied by a short comment. This is actually quite amazing since the first detailed descriptions originate from as long back as the beginning of the industrial era . By the end of the 19th century, as the quest for oil and gas ran riot, first in North America, then on other continents, the light emitted by the gas flares at the development sites was soon to become the biggest cause of light pollution on the planet. In those years, newspapers as well as astronomical and meteorological journals regularly carried reports of strange vertical streaks of light in the night sky which defied explanation. Only few commentators - and even fewer observers - linked the lights to their true origin. Because of their comet-like appearance, the lights were initially designated as "gas comets". The following is an excerpt from The Ohio Press of Friday December 3, 1886. It is one of the few examples in which the reported "bright streaks or bars of light" were attributed to a precise source: in this case a "burning gas well". At least, that was the opinion of Col. T.B. ROBERTS, who in those days was considered an "expert upon gas comets". Our citizens on last Saturday night, were much interested in the appearance of a brilliant sheet of light in the south western horizon, and came to the conclusion that they had discovered an unexpected comet, and watched for the strange phenomenon on Sunday evening, but it was not quite as clear. After much discussion the conclusion was reached that it was a peculiar reflection or refraction of light from the escape pipe of the Royal Gas Company over the river. Col. T.B. Roberts, an expert upon gas comets, gives the following explanation of the strange phenomenon. They are peculiar reflections in the sky over burning gas wells or stand pipes, and are caused in some way by the focusing of the rays of light on certain of the probably icy particles suspended or floating in the higher atmosphere and appear on clear cold nights. They never reach down to the sources of their origin. Their appearance is much the same as that of a comet, only there is no nucleus, neither does the tail expand in width. They are in fact simply bright streaks or bars of light, always measuring on an average one quarter of a degree in width, (say half the apparent diameter of the moon) and from 5 to 15 degrees in length. My observation of those which were visible on Saturday night (no less than ten being in sight simultaneously) tends to the belief that they are quite large. From base to top the bar of light subtended a further angle of about eight degrees, which would indicate a length for the "comet" of about two and one-half miles. In upper extremity was, therefore, about six and one-half miles above the earth's surface. A pillar of fire by night - measuring 2-1/2 miles long 350 feet in diameter, suspended vertically in the sky between the altitudes of 6-1/2 and 4 miles - is certainly a novelty, at least unheard of since the days of Moses' sojourn in the desert. The phenomena attending their display are worthy of scientific investigation, for we may learn from them something regarding the conditions of the atmosphere in the higher strata of use in prognosticating the weather. Some of the doubts which exist in the minds of astronomers in regard to the elevation and propagation of auroral lights might be resolved also by a study of them. In the late 1930s, another amateur astronomer, W.S. ATHEY, member of the Houston Astronomical Society in Texas, investigated several strange night lights that had been observed from Houston and from ships in the Gulf of Mexico. ATHEY's final conclusion was that the lights were "a reflection of extensive natural gas flaring in connection with East Texas oil production" . After that, reports became rare. We suspect that modern aviation is partly to blame for this. After all, it was during the second half of the 20th century that water vapour trails from aircraft became a familiar sight. When a condensation trail is illuminated by a low Sun, and the aircraft that produces it is at a great distance, moving in the direction of or away from the observer, its aspect can be very similar to that of a pillar-shaped reflection from a ground-based light source. Another possible explanation for the lower number of reports during the second half of the past century is that, in July 1947, "flying saucers" zoomed onto the headlines of American and European newspapers. From that moment on, meteorological and astronomical societies were no longer regarded as the only experts on unusual sky phenomena. Because of this, many witnesses chose to report their experiences to "saucer hunters" instead of scientific institutions, while at the same time scientific editors became increasingly reluctant to open the pages of their journals to sightings of unusual lights in the sky. With the exception of a few sporadic mentions in meteorological and astronomical publications, light pillars in high clouds were largely ignored in recent decades. The present study is a first attempt to bring together sightings from different parts of the world. In the process of unearthing this material, it was found that the ignorance surrounding the phenomenon persists to this day. Because of this, reports of light pillars have sparked unwarranted speculation, not only from ufologists and conspirationalists (who are inclined to attribute the sightings to extraterrestrial spaceships or secret military tests), but also among astronomers and meteorologists (who sometimes mistake them for auroral pillars, a specific type of aurora that shows as vertical streaks of light). A situation that is hard to understand, especially in the light of the findings published by the early amateur astronomers cited above. WILLIAMS, Thomas R., "Early Amateur Astronomers in Houston" in GuideStar, December 2001, p. 8. For more details about the sightings that were recorded in the 1930s and 40s see: Texas Observers' Bulletin (various issues from 1935 till 1943). Our special thanks to Tom WILLIAMS of the Houston Astronomical Society and to Dr. Roger RAINWATER of the Texas Christian University Library for helping us procure photocopies of these articles.